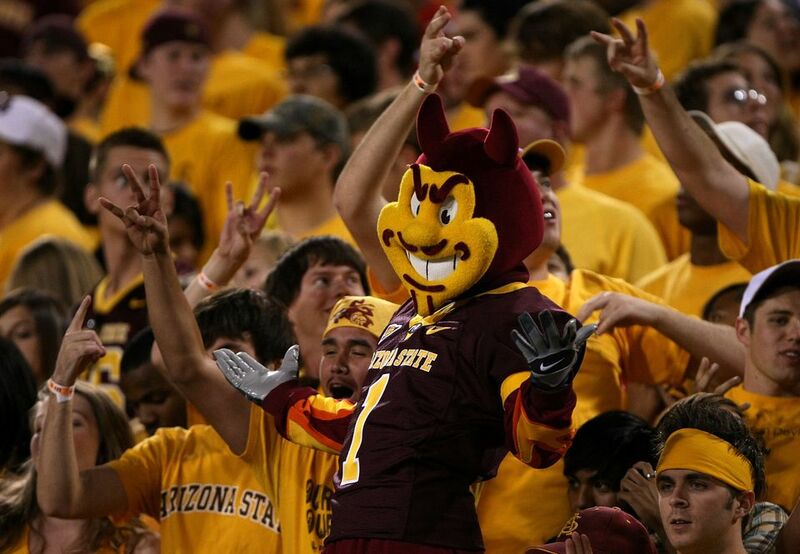 Sparky is the mascot of the Arizona State University Sun Devil teams. Sparky became the school's mascot in 1946. Prior to being called the Sun Devils, Arizona State University teams were 'Bulldogs' and, before that, 'Owls'. Wilbur and Wilma are the mascots of the University of Arizona. They are, of course, Wildcats, as are all U of A students. Wibur T. Wildcat (Wilbur The Wildcat) has been top dog, er, cat at the University of Arizona since 1959. He is also one of the only mascots who is married. Wilbur and Wilma were married November 21, 1986. Lumberjacks used to be all over northern Arizona, and especially in Flagstaff where Northern Arizona University is located. Louie the Lumberjack looks pretty mean, and when he isn't carrying a tee shirt shooter, he's hauling around an axe. This mascot's inaugural year was 1980, and for many he has become the standard by which team mascots are judged. The Gorilla travels the world, makes appearances all year long, many at schools around Arizona. The Phoenix Suns' mascot is sometimes referred to by the nickname "Go." We all just know him as The Gorilla. According to the Phoenix Suns Official Web Site, the Phoenix Suns Gorilla has been named MVP every season -- Most Valuable Primate. Baxter's formal name is "D. Baxter the Bobcat" and he joined the roster of the Arizona Diamondbacks in 2000. It's actually a very clever name for the mascot since the team is usually referred to as the D-backs (D-backs--D. Baxter... get it?). Before the stadium was renamed Chase Field, the team played at Bank One Ballpark, commonly referred to as BOB (BOB--Bobcat...get it?). Anyway, lots of people were upset that the teams didn't have some kind of snake as a mascot ​since that's what a diamondback is. The idea for the mascot's name came from Jay Bell's young son, Brantley. If you have a Twitter account, you can follow Baxter's antics at @DbacksBaxter. Big Red is, obviously, a Cardinal. He made his first appearance as a team mascot on October 4th, 1998. Big Red makes personal appearances year-round at schools, hospitals, parades, and charitable events. When the Mercury rises, and the opposing team can't stand the heat, Scorch is there to cheer on our Phoenix Mercury basketball team. Scorch was introduced as the Mercury's mascot in 2000. Although the basketball players are women, Scorch is a male mascot. According to the Phoenix Mercury, Scorch is a “real hottie”! © Phoenix College, reprinted with permission. Phoenix College actually had a real bear as their mascot when, in 1920, a student purchased a black bear cub from a circus. As the cub grew, he became harder to control at the games, and a new home was found for the bear. Today, Bumstead the Bear is a 'safer' mascot for the home team. The Arizona Rattlers play Arena Football at US Airways Center in Downtown Phoenix. Arena football is a high, scoring lively game and the Arizona fans are an excitable bunch. Still, what's a great team without a mascot? In 2012 Stryker D. Rattler was officially hired. The official word from the front office is that he was born under a boulder in the Superstition Mountains and his hobbies include getting loud for the Arizona Rattlers, meeting new friends and fans, going out for a "bite", sunbathing, hanging with Fang and tracking unsuspecting prey. You can read more about Stryker D. Rattler online. Howler is one of the newest team mascots of all the professional sports teams in Arizona. Howler was born as the team mascot for the Phoenix Coyotes NHL Hockey Club in 2005. In 2014 the club changed its name to Arizona Coyotes. Howler wears number 96. If you have to ask what kind of animal Howler is, you're just not paying attention! Find out more about the Arizona Coyotes, and get the current schedule here. The antelope was selected as the school mascot in 1949. It is an animal found in Arizona and is associated with strength and grace. Thunder is very athletic and adds that excitement and home-pride atmosphere at sporting events. Thunder wears number 49, in honor of the year that the school was founded. He wears the colors of the school, purple and white, representing royalty and divinity. Grand Canyon University is a private Christian university located in West Phoenix. While Arizona has had hockey teams that used the Roadrunners name before, the Tucson Roadrunners began playing during the 2016/2017 season. The Tucson Roadrunners hockey club is the American Hockey League affiliate of the Arizona Coyotes. The mascot is, naturally, a roadrunner. The real roadrunners are common in the Phoenix desert, tending to stay mostly on the ground. They are fast, just like in the cartoons! They eat snakes and lizards. The roadrunner is not Arizona's State Bird; New Mexico has that honor.